"Tar Heel" is the nickname for a native or resident of North Carolina as well as for the state itself, which is known as the Tar Heel State. The term appears to have come into popular use after the Civil War, despite its clear connection to North Carolina's prominent role in the naval stores (tar, turpentine, and pitch) industry going back to prerevolutionary times. Its earliest known use is in a diary entry written by 2nd Lt. William B. A. Lowrance of the 46th Regiment North Carolina Troops. In an entry dated 6 Feb. 1863, Lowrance, encamped in Pender or Onslow County, wrote: "I know now what is meant by the piney woods region of North Carolina and the idea occurs to me that it is no wonder we are called 'tar heels.'" Almost every North Carolina company formed for Confederate service adopted a nickname, but not a single one used the term Tar Heel. Stories abound regarding the derogatory origin of the term. Circumstantial evidence indicates that the term was originally coined in 1862 as an insulting name for North Carolina soldiers in the Army of Northern Virginia by soldiers of other states, particularly Virginia. Capt. William McWillie of Richard Anderson's staff recalled that at Fredericksburg, Va., troops called out to a passing North Carolina brigade, "Now tar heels when you get out yonder clap your foot down and stick." North Carolina soldiers quickly learned to return the fire. Mississippians hurled the intended insult at a limping North Carolina mountaineer immediately after Second Fredericksburg in May 1863. After the Confederate lines on Marye's Heights had been broken and later restored, the North Carolina soldier replied, "Yes, damn you. If yer hadder had some tar on yer own heels yestiddy, yer would er stuck to them thar works better, and we wouldn't er had to put yer back thar." Despite its initial derogatory intent, the term soon was adopted by North Carolina soldiers themselves. The official seal of approval of Tar Heel as a nickname for North Carolinians came when Governor Zebulon B. Vance visited the Army of Northern Virginia on 28 Mar. 1864. As it was described in a letter home the next day by Pvt. Walter Battle of the 4th Regiment North Carolina Troops, Vance made a point of using the term: "He [Governor Vance] said it did not sound right to him to address us as 'Fellow Soldiers,' because he was not one of us-he used to be until he shirked out of the service for a little office down in North Carolina, so now he would address us as 'Fellow Tar Heels,' as we always stick." Evidence indicates that the term "Tar Heel" permanently moved from insult to honored nickname at the Battle of Reams Station in Virginia on 25 Aug. 1864. Upon learning of the leading role of the North Carolina brigades in that signal Confederate victory, Gen. Robert E. Lee reportedly cried out, "Thank God for the Tar Heel boys." Tradition has long attested to this incident. While no source directly proves such an utterance, Lee did write a letter to Vance praising the conduct of the North Carolina troops at Reams Station. Following the Civil War, the use of "Tar Heel" rapidly became widespread in North Carolina. 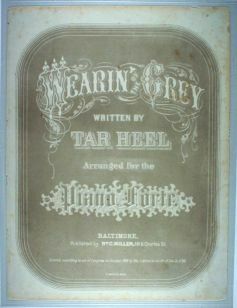 The first known postwar printed use of the term was in sheet music published in Baltimore in 1866 by William C. Miller, entitled "Wearin' of the Grey," written by "Tar Heel." The town of Tar Heel in Bladen County was settled in 1874, although not incorporated until 1963. The University of North Carolina football team changed its name from the White Phantoms to the Tar Heels in the 1920s, and all of the university's sports teams came to bear the moniker. The term-often erroneously rendered as one word, "tarheel"-is the standard nickname for North Carolina and North Carolinians alike. It is also commonly used throughout the state in the names of many businesses, services, and organizations. B. A. Botkin, ed., A Treasury of Southern Folklore (1947). William S. Powell, "What's in a Name?," Tar Heel (March 1982). Michael W. Taylor, To Drive the Enemy from Southern Soil: The Letters of Colonel Francis Marion Parker and the History of the Thirtieth Regiment N.C.T. (1998). "Wearin' of the Grey written by Tar Heel," first printed in 1866,published by William Miller. Image courtesy of the North Carolina Department of Cultural Resourse Digital Collections. Available from http://digital.ncdcr.gov/cdm4/document.php?CISOROOT=/p15012coll11&CISOPTR=111&REC=11 (accessed September 6, 2012). 1 January 2006 | Taylor, Michael W.
Here is an article about the State Bird, the cardinal: https://www.ncpedia.org/symbols/bird. I am proud to be a Grey Tarheel. The quote from Governor Vance attributed to a letter from Pvt. Walter Battle was not presented without citation. The article should rightly cite that the source of this quote was the book "Forget-Me-Nots of the Civil War" by my Great Great Grand Aunt, Laura Elizabeth Lee Battle. The entire text of the book is available online through UNC Chapel Hill's "Documenting the American South" project (http://docsouth.unc.edu/fpn/battle/lee.html). I've attempted to locate the original letters transcribed in the book, but thus far have not found them.